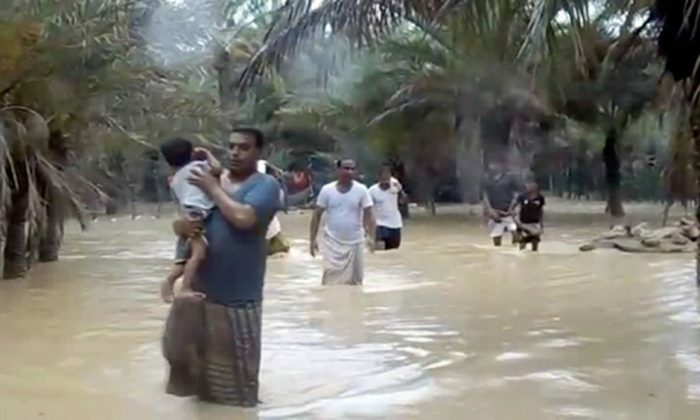 DUBAI—Yemen declared a state of emergency on Socotra on Thursday after a tropical storm flooded several villages and capsized boats on the island and left at least 17 people missing, government officials said. Socotra, which lies between the Arabian Peninsula and Horn of Africa, has been largely untouched by a three-year-old war in Yemen and is under the control of the internationally recognized government whose president remains in exile in Saudi Arabia. The island “requires urgent aid to help people stranded in their villages or those who reside in the mountains”, government spokesman Rajeh Badi told the state news agency SABA. He said 17 people were missing after two boats capsized and three cars were washed away by floods. Another official said more than 200 families had been evacuated from their villages. Badi urged a Saudi-led military coalition and international organizations to provide urgent aid to the island. The Western-backed alliance intervened against the Iran-aligned Houthi movement in Yemen in 2015 to restore the government of Abdu Rabbu Mansour Hadi. Saudi and UAE forces have a presence on Socotra island. The storm is expected to hit southern Yemen and the coast of neighboring Oman on Thursday, Oman’s state news agency reported. It said Omani authorities evacuated hospitals in Dhofar province and other areas bordering Yemen. Yemen is already grappling with the world’s most urgent humanitarian crisis. The war has killed more than 10,000 people, displaced three million and pushed the impoverished country to the verge of starvation, according to the United Nations. A tropical cyclone hit the Horn of Africa on Wednesday, killing more than 50 people in Somaliland.